Studying abroad in New Zealand is paradise for nature lovers. The North Island offers sailing, beaches, and hot springs. On the South Island, wild rainforest, the Southern Alps, glaciers, and gold towns await your exploration. More than 800 years ago, the Maori became the first people to migrate to New Zealand, crossing the South Pacific in canoes and navigating by the stars. European whalers and explorers found the islands much later. In 1840, New Zealand became a British colony, creating a unique and culturally diverse country with Maori carved meeting houses and British colonial architecture. As you can tell, the New Zealand study abroad experience is one of a kind. Now it’s your turn to study abroad in New Zealand and explore this vast country and immerse yourself in university culture through our direct enrollment programs. Auckland, New Zealand’s capital, is located on the North Island, situated between two harbors. Non-native English speakers, please see the Application Requirements link under "Get started." There are more than 130 species of animals at the Auckland Zoo, and the collection is quite impressive. Among the favorites are the Indian Elephants, African lions, colorful parrots, friendly orangutans, giraffes, wallabies, and of course, the New Zealand icon, kiwis! The Auckland Sky Tower is the tallest man-made structure in New Zealand. Located in the Central Business District, the Tower reaches more than 1000 feet into the air and has become iconic of Auckland. Just minutes from miles of clear blue water, Auckland is one of the most beautiful cities in the Southern Hemisphere. A boat tour is the perfect way to enjoy and see Auckland. Many companies offer different boat tours, including speed boats and sailboats. Located on the east coast of the South Island, Christchurch is a vibrant city and a gateway to many natural wonders and outdoor activities. 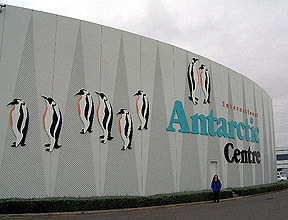 The Antarctic Centre recreates the environment of Antarctica. There are numerous exciting opportunities at the Centre, including snowmaking, dining with penguins, an outdoor adventure ride, and much more. Nature-lovers will surely enjoy the Willowbank Wildlife Reserves. Visitors can see and touch the most unique species, some of which are endangered. The Kiwi birds are one of the most popular attractions at the Reserves. At night, the Reserves offer a wildlife tour that is truly amazing. We are already almost at mid-semester break here at the University of Auckland. It’s crazy how time flies. I feel like I just arrived yesterday, but I have already done so much in these past six weeks. This includes exploring Auckland in different ways. I am mostly doing this by going outside my comfort zone to try new things. A few weekends ago, I was able to take a trip up to one of New Zealand’s 10 great walks. The Tongariro Alpine Crossing is said to be one of the most beautiful day hikes in the world. This hike lived up to its expectations. It's three weeks into the semester at the University of Auckland, and I have started to become active in clubs and activities on campus. I play field hockey for the University of Rochester, so coming to New Zealand I knew I wanted to get involved in club field hockey here. There was also a club fair the first week of classes where I signed up for the underwater club and the tramping club, which is the hiking club. Hi everyone!! I have been in New Zealand for a little over a month now, and it already feels like home here in Christchurch! I decided to post photos of things to do around the city for those potentially studying here or planning a trip in the near future. Christchurch is one of the biggest cities in New Zealand and the biggest on the south island, meaning there is plenty to do and see while here. Below are a bunch of my favorite pictures and places you can easily get to from university. I have been in Auckland for a little over two weeks now, and every day I have been blown away by the beauty of my surroundings. Auckland was not quite what I expected. I heard it was a big city so I assumed that would mean lots of tall buildings, very little nature, and streets that weren’t the cleanest. However, it has completely surprised me. There are parks all around and everywhere I look there are unique-looking trees that I would never see back home.